Learn how to easily create an old, vintage photo effect with Photoshop and its powerful Camera Raw Filter. Now fully updated for Photoshop CC 2019. 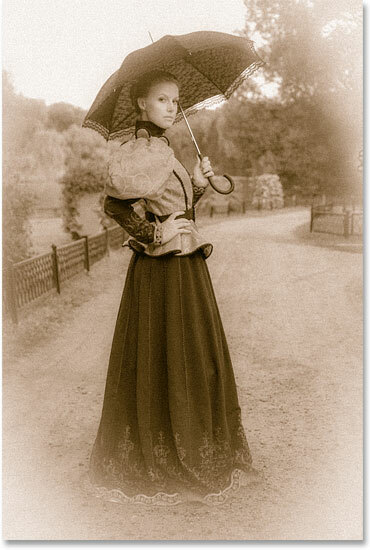 To create the "old photo" effect, we'll start by turning our original color image into black and white, and then we'll add a sepia tone for an old fashioned look. We'll add grain and a vignette effect, and we'll make the image look like it has faded over time by toning down the highlights, lightening the shadows and reducing contrast in the midtones. And we'll create the entire effect from start to finish using nothing more than Photoshop's Camera Raw Filter. To keep the "old photo" effect non-destructive, I'll show you how to apply the Camera Raw Filter as a smart filter. This will keep the effect separate from the image itself so you're not making any permanent changes. The original photo will remain completely unharmed. This tutorial has been updated to include recent changes to Camera Raw, and for best results, you'll want to be using the latest version of Photoshop CC. If you're using an older version of Photoshop, you can create a similar effect without the Camera Raw Filter by following my Turn A New Photo Into An Old Photo tutorial. 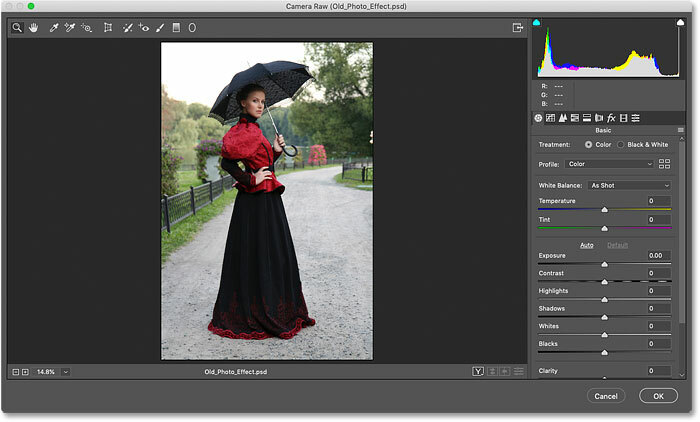 In a moment, we'll use Photoshop's Camera Raw Filter to create our "old photo" effect. But to keep the effect non-destructive, we'll need to apply the Camera Raw Filter as a smart filter. And to do that, we first need to convert the Background layer into a smart object. The smart object icon in the preview thumbnail. 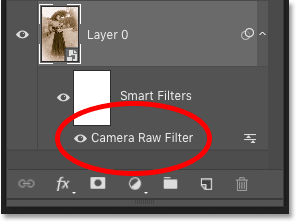 The Camera Raw Filter's dialog box in Photoshop CC 2019. Clicking the Full Screen Mode icon. Setting the Treatment to Black & White. Clicking the Black & White Mix panel's tab. 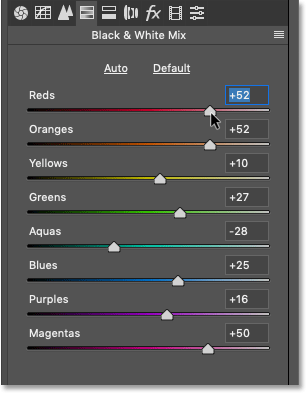 Then, use the color sliders (Reds, Oranges, Yellows, Greens, Aquas, Blues, Purples, Magentas) to lighten or darken any areas in the black and white version that originally contained those colors. For example, dragging the Reds slider to the right will lighten any areas in the black and white version that originally contained red. Dragging the Greens slider to the left will darken any areas that contained green, and so on. If you drag a color slider and nothing happens, it's because no part of your image contained that particular color. Drag the color sliders to adjust the brightness of different areas in the black and white version. My custom black and white version. Clicking the Split Toning panel's tab. For the Highlights set at the top, set the Hue value to 40 for a nice orange-yellow. Then increase the Saturation value to 20. 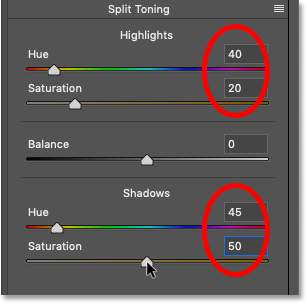 Note that you won't see any change in the hue until you increase the saturation from its default value of 0. The Hue and Saturation values for the Highlights (top) and Shadows (bottom). The "old photo" effect after adding the sepia tone. Clicking the Effects ("fx") tab. 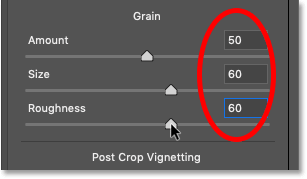 The Effects panel in Camera Raw is limited to just two effects, grain and vignetting. But both will help us out with our "old photo" effect. The "old photo" effect with the grain added. 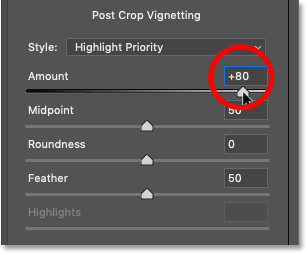 Next, still in the Effects panel, we'll add a vignette effect using the Post Crop Vignetting section. The main control here is the Amount slider at the top. If you drag the Amount slider to the left, you'll darken the edges and corners of the image. That's usually the result you want when adding a vignette, but it's the opposite of what we want for our "old photo" effect. Increasing the Amount value to lighten the corners of the image. The "old photo" effect after adding both the grain and a vignette. Images that have faded over time have less overall contrast, and we can reduce the contrast of our image using a few simple sliders in the Basic panel. First, to tone down the highlights, lower the Highlights value by dragging the slider to the left. I'll lower mine to -70, but you'll want to keep an eye on your own image as you drag the slider to judge the results. Then, lighten the shadows by dragging the Shadows slider to the right. I'll increase my Shadows value to +80 to really brighten them up. But again, you'll want to keep an eye on your image to see what value works best. Dragging the Highlights, Shadows and Clarity sliders. The image now looks to have faded over time. 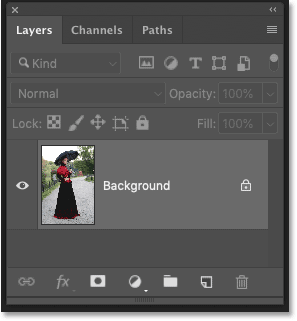 The Layers panel showing the Camera Raw smart filter. 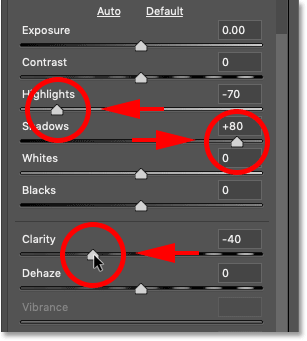 Click the visibility icon to toggle the Camera Raw Filter on and off. The original image without the "old photo" effect. 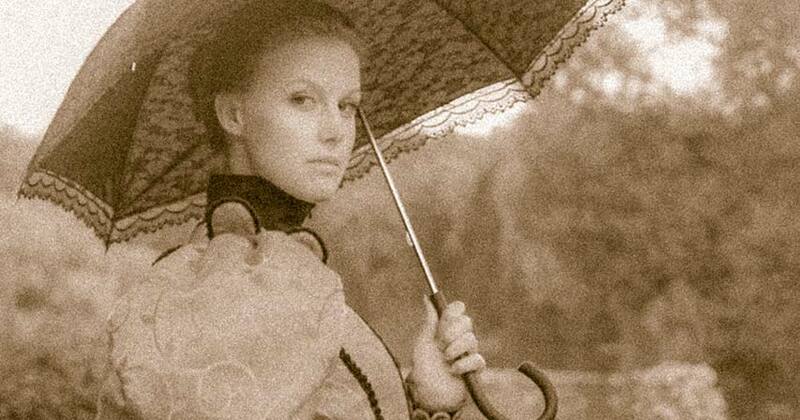 The final antique photo effect. And there we have it! 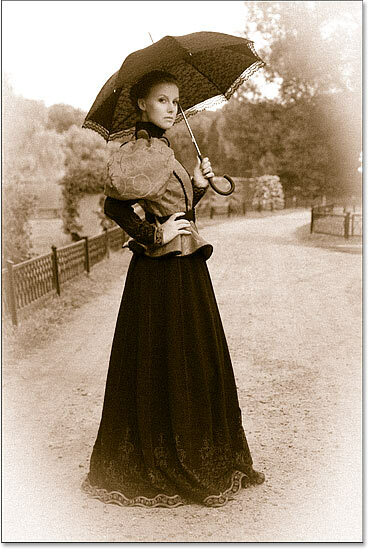 That's how easy it is to add an old, vintage photo effect to an image using the Camera Raw Filter in Photoshop! For similar tutorials, learn how to add folds and creases to an image, or how to create a worn, torn photo edges effect. Visit our Photo Effects section for more tutorials. And don't forget, all of our Photoshop tutorials are now available to download as PDF's!